Johannesburg – Since last Saturday, the poorest areas in Mamelodi, Pretoria, have again seen violence, forced evictions and the frantic “evacuations” of foreign shopkeepers and their stock. Reflecting patterns seen across the country, marauding groups have made their way through various areas, largely unencumbered by resistance from the police or residents. Unlike the mass “xenophobic’’ violence that shook the country in May 2008, these less massive attacks appear to be triggered by banal arguments between individuals. In Mamelodi, a conflict between a South African shopper and a foreign businessman was the spark that ignited a far broader communal conflagration between South African citizens and foreign shopkeepers. Elsewhere these localised instances of xenophobic violence have been triggered by street fights, inadvertent injuries to children, or any number of other everyday accidents or assaults. Whatever one thinks of the country’s immigration policies, incidents like these reflect dangerous trends in South African society: ineffective and reactive policing and vigilante strategies that hold groups responsible for the behaviour of individuals. For everyone living outside the sanctity and safety of gated communities, this combination only adds to the risks we face on the streets and at home. In Mamelodi, this is not the first time such zealous attacks on foreigners have occurred. In May last year, Somali shopkeeper Bishar Isaack shot and killed two Zimbabweans, purportedly for fear of being attacked again in Diepsloot. Local residents responded, first by looting Isaack’s shop and then almost every other Somali and Bangladeshi-owned business in the area. According to a young plunderer, what had happened was “payback time and not xenophobia: we could not stand by and watch them get away with the shooting”. 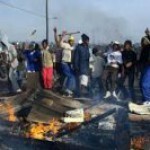 In 2007, when South Africa was just learning the term xenophobic violence, residents of Motherwell near Port Elizabeth took revenge for a similar shooting by clearing out hundreds of Somalis from their community in less than 24 hours. Time and time again, groups of foreigners and other minorities are being held responsible for crimes conducted by individuals. Beyond the specific crimes, they are collectively blamed for the failures and frustrations associated with poor policing, service delivery shortcomings and lack of job creation. The question is not about immigration policy, the details of a particular crime, or legitimising violence from any party. Immigration in this instance is a red herring. Migrants only account for a tiny percentage of crime and unemployment. Moreover, they must obey the same laws as everyone else. But does anyone have to follow the law? What we are witnessing is an institutional failure. The police bear much of this responsibility: their limited ability to entrench a law-based system of conflict resolution means that residents across the country regularly settle disputes in ways that are illegal, unjust and often violent. Such attacks have many targets, but foreigners seem disproportionally attacked. Here too the police are at least partially to blame. Rather than holding responsible parties to account, officers regularly further the gangsters’ work: checking documents, arresting foreign nationals, and escorting them and their goods out of townships. Through either non-intervention or such complicity, they legitimise not the law, but communal violence. The consequences of these failures are both material and social. The inability to protect human lives and property undermines any effort to alleviate poverty. In these melees, it is not only foreigners who lose their shops, but local populations who must pay more for goods or walk further through dangerous nights to buy basic supplies. A few South African business owners may benefit, but most residents do not. At a social level, we see modes of justice informed not by individual responsibility or human rights, but by principles of Sippenhaft, a term popularised during the Nazi regime. Literally meaning “kin liability”, it holds a whole group of people (then the Jews, here foreign shopkeepers) responsible for an individual’s purported crime. As in Nazi Germany, unpopular groups in South Africa are made to “pay” with their properties and lives. While the plight of foreigners in South Africa is not a pressing issue for politicians or the police, the nature and effects of such attacks are not limited to Somali, Bangladeshi or other foreign victims. Instead, such violent popular re-production and policing of stereotyped group boundaries creates a permanently unpredictable social climate of intolerance. Race may be the most obvious boundary in South African society, but we also see township violence and vigilantism organised around language, political party, or even a person’s home village. Neither reports nor politicians draw adequate attention to these dynamics preferring instead to dismiss them as criminality or the natural consequences of poverty and inequality. We share a collective responsibility to counter poverty. In achieving this goal, can we allow the lives and livelihoods of whole groups – be they ethnic, national, religious or linguistic –to be threatened for the perceived misdeeds of a few? * Loren B Landau and Iriann Freemantle are researchers for the African Centre for Migration & Society at Wits University.